Living with a thyroid disorder means overcoming a number of challenges. The effect of hyperparathyroidism on your life can be very stressful and trying, but there is help. If hyperparathyroidism has led to heavy medical bills and made it difficult for you to work, you may be eligible for disability benefits from Social Security. Hyperparathyroidism develops when a person’s overactive parathyroid glands produce more parathyroid hormone (PTH) than the body needs. This hormone regulates the levels of calcium and phosphate in the body, nutrients that are necessary for nerve cells to communicate with each other. High levels of PTH lead to elevated calcium levels, which interferes with the nervous system’s ability to function normally. Hyperparathyroidism is most commonly caused by benign tumors (adenomas) of the parathyroid glands, located in the neck. Around 97% of all cases of hyperparathyroidism are caused by these tumors. The condition can be alleviated by surgically removing the tumor, but not every patient is a suitable candidate for surgery. Many patients must get by with prescription medications. Most of the visible symptoms of hyperparathyroidism are caused by this disruption of the nervous system. People with hyperparathyroidism experience weakness and fatigue, muscle soreness, depression, nausea and decreased appetite, constipation, and kidney stones. Hyperparathyroidism draws this calcium from the bone, leading to bone damage, pain, and eventually osteoporosis. With the help of disability benefits from Social Security, you can meet your medical needs and everyday expenses more easily. As part of bringing your condition back under control and returning to the workforce, you can also work with your lawyer to create an Individualized Plan for Employment (IPE). Your IPE can include services such as job placement and training to help you return to work. If you have been diagnosed with a potentially disabling condition, you need to know your legal rights. 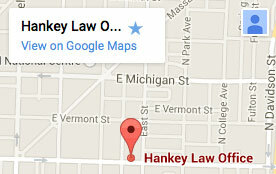 To discuss your case with an experienced Indianapolis disability lawyer today, contact the Hankey Law Office at (800) 520-3633.